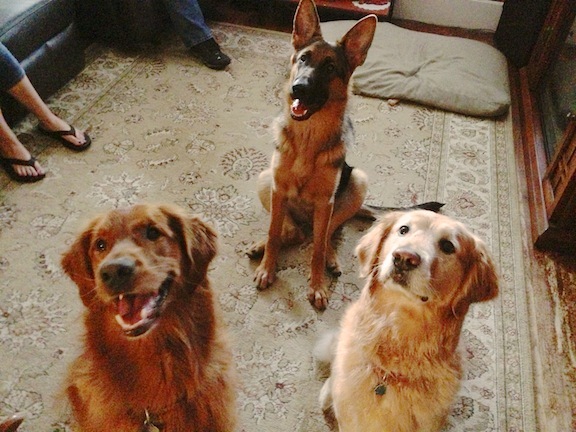 Scout is a five-year-old golden retriever (pictured here on the left with his roommates; seven-month-old German Shepherd Storm and Sabrina a seven-year-old Golden Retriever. Scout’s owner has a canine waste collection service and he accompanies her while she works. His owner had contacted me to help stop Scout’s barking whenever she exited the truck at a client’s home. When I arrived, all three dogs met me at the door barking, jumping up and thrusting their noses into my bag. This behavior continued when I sat down with their owner to discuss the situation. Although it was clear none of them were at all aggressive, all three dogs ignored their owner to one extent or another. While this isn’t threatening to guests, it certainly isn’t the best of manners and indicates a lack of respect for their authority. When I asked what rules the dogs were expected to follow, their owners could really only come up with one – to stay off furniture. That rule was not respected by all the dogs as I witnessed Scout attempt to get up on the couch more than once during our conversation. The dog’s owner was using handclaps and the word “No” whenever she wanted to disagree with the dog’s behavior, to little effect. While it momentarily stopped some of the dogs from misbehaving some of the time, they clearly didn’t understand or respect what their owner was trying to communicate. I suggested a new approach; the concept of escalating consequences applied consistently any time the dog engages in a behavior or activity we dont like. Although it’s difficult at times to remember, when a dog does something we don’t want – it’s not doing it to intentionally annoy or frustrate us. It just wants what it wants. So its important we dont take the dog’s behavior personally. When leading or correcting a dog, the best results are received when a calm, nonemotional approach is used. The first consequence i use is a hissing sound. I use this sound to disagree with any behavior I don’t want a dog to engage in. Using a specific sound that has no other use is helpful as the dog instantly understands when we are addressing them rather than using a word in normal conversation. Using words such as “no” or “OK” are not ideal because we use those words so frequently in our regular conversation. If the sound doesn’t stop the behavior, the next consequence is to stand up. As simple as it sounds, the act of suddenly standing upright often will get a dog’s attention much better than yelling at it. If the dog continues to misbehave, the next consequence is to march in the dog’s direction and continue walking almost through the dog to make the dog move out of your way. This often distracts the dog from whatever action it is doing and helps the dog see you as an authoritative figure it needs to defer to. If the three previous consequences fail to get the dog to fall into line, I suggested putting the dog on a leash in the house. Sometimes the simple act of placing a dog on a leash will change its behavior. It also gives the owner more control over the situation as well as another means to communicate with the dog. If the dog continues to disregard its owner’s wishes, I suggested that they take the dog into a quiet room with less stimulation such as a laundry room or empty bedroom. By remaining in the room with the dog and making it remain in place away from any stimulation it was reacting to, the dog is able to calm itself and return to a more balanced state of mind. One of the most fundamental things that I try to accomplish in my sessions is to explain to the owner how important it is to get the dog to remain in a calm and balanced state of mind. When a dog gets overstimulated or excited, it is very difficult for it to do anything other than what it is focusing on. This includes following it’s owner’s instructions or corrections. Whenever a dog starts to get too wound up or overstimulated, it’s always a good idea to give the dog a “time out” of sorts. By making the dog stop and remain sitting until it settles down anytime it passes the energy / excitement threshold its owners find acceptable, it’s much easier to correct and control the dog. For example, If a dog gets excited simply because it’s owner picked up a leash (the sight and sound if the leash triggering a “we’re going for a walk” reaction from the dog), I always advise the owner stand still and not react to the dog. Once it calms down and is able to sit and remain sitting, only then do I place the leash on its collar and continue. By stopping and waiting for the dog to settle itself down every time it gets overstimulated, the dog learns that it is the one that is stopping things, not its owner. Once the dog makes this realization, it starts acting in a more calm and balanced state of mind, all the time. I showed Scout’s owners a leadership exercise that they can practice to help the dog learn to focus, follow their commands and see them as its pack leader. Scout only needed three repetitions of this exercise before he understood what I was asking from him. At that point I coached his family through the exercise until they start mastered it. One of scouts owners mentioned that the German Shepherd puppy Storm may have more difficulty doing the exercise than Scout so we repeated the exercise with him. It’s a good thing the owner spoke up, as storm was very different than Scout in his reaction to the exercise. It took several repetitions and quite a bit of time before Storm came to understand what I was asking from him. This isn’t that unusual as Storm is not even a year old. When I asked the last time that the dogs of been taken out for a walk, I learned that they pulled to such extent on the lease that their owners had given up on that exercise. Since the walk is such a fundamentally important leadership exercise, I showed them my special twists of Martingale collar and leash to get the dogs to stop pulling. Scott was immediately much more attentive to his owner on the walk and fell into a nice heel next to her with very few corrections needed. The Martingale collar setup works every time! Next we discussed a very primal activity that every dog engages in; mealtime. Their owners had gotten into a habit of feeding the dogs before they fed themselves. For dogs, the order in which food is eaten has a direct correlation to their position of authority and status in the pack. For this reason, I suggested that the dog’s owner eat a granola bar or yogurt in the morning prior to feeding the dogs to help the dog’s see them as leaders. I also suggested adding structure and discipline to the ritual of feeding the dogs. Instead of placing the dog’s food in their bowls and simultaneously allowing the dogs to eat it, I suggested that their owner control the situation by placing food in all three bowls, but blocking the dogs from eating until given permission to do so and only after the human eats in front of them. These may seem like minor changes, but they usually have a dramatic impact on how dogs perceive their owners. Next I showed their owners how to claim the doorway and disagree with the dogs whenever they charged at the door. By keeping the dogs a respectable distance from the door, our guests are able to come in and feel a little bit more comfortable when they arrive. The distance also helps the dogs learn to calm down since they cannot immediately jump up on, sniff or rub up against the new exciting guests. By the end of the session, all three dogs were showing much more respect for their owners commands and personal space – no longer jumping up or trying to steal cookies out of my hand. Their owner commented on how much better behaved they were in such a short period of time. That’s one of the great things about dogs, they truly do live in the moment. By repeating the leadership exercises, giving the dogs a “time out” when they get over excited and continuing to feed the dogs in a more structured way, this new balanced behavior and respect for their owner’s authority and leadership will quickly become permanent.